Sunshine, a baker who makes the most delectable-sounding cinnamon rolls, is a nurturer who finds herself chained up in a deserted mansion, intended to "nurture" (in the fatal sense) an imprisoned vampire named Con. Con resists the allure of her blood and together, they escape the mansion and strike up an alliance to battle the evil vamps who have vowed to destroy him. It sounds like a fairly typical Urban Fantasy vampire series, but it is so much more than that. This is not a book that goes down the typical path of "The vampire who waited centuries to find his one true love/The human girl who captures his elusive heart." Sunshine is no Mary Sue. Con does not stride around in nothing but leather pants. In fact, McKinley makes it clear that Con isn't particularly attractive; his Otherness is too Other for that. Sunshine and Con's relationship is complicated and compelling, as is the alternate-reality universe in which they live, but it avoids all of the storytelling tropes – satisfying as they can be – that you see in many other Urban Fantasy book series. The world it's set in is so complex and fully realized that you feel like countless other stories are swirling on the edges, begging to be told. But we'll never get to read them. You see, unlike many other intriguing Urban Fantasy novels, it's a stand-alone book. It's one lone novel on bookstore shelves that are swamped with increasing numbers of series. This once-and-done approach may have kept it from achieving the fan frenzy experienced by authors who produce ever more tales so readers can follow their favorite protagonists from book to book. But this isn't all bad. No sequels means we will never have to experience a disappointing watering down of this rich, utterly real world. Characters aren't going to make up, break up and partner hop. They're not going to develop shiny new powers. They're not going to stagnate in their emotional growth or becomes unrecognizable parodies of themselves. I would dearly love to read more books set in this world, and I'm not the only one. 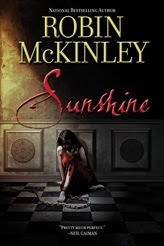 (Seriously, "sunshine robin mckinley sequel" is a suggested search term on Google.) But instead, McKinley gave us one perfect novel set in a sad, scary, hopeful world that's at once familiar and utterly alien, and then she walked away. That's brave, and I applaud her. To say more about the details of this absorbing read would rob you of the pleasure of the world McKinley has built. Just know that it is a unique, fully realized alternate reality that you will become immersed in and will be sad to leave behind when you come to the end of the book. I agree - Sunshine is an excellent book. It did take me awhile to get into it, but I was really glad I stuck with it. I've heard people complain about the ending - it is not a "traditional" ending, but I found it completely satisfying. Read it 5 times. McKinley is one of my favorite authors. Every book of hers is rich enough to read multiple times, and each is strikingly different. Not on the Kindle? Oh the humanity! I love Sunshine, but readers do tend to be disappointed that there will be no sequel.